Custom Imprinted Golf Tees Personalized in Bulk. Promotional, Very Inexpensive. 2-18", 2-3/4", 3-1/4". Budget Prices in USA and Canada. 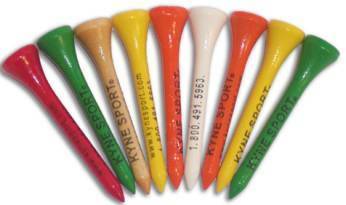 2-1/8", 2 3/4" and 3 1/4" Bulk Custom Imprinted Golf Tees. These hardwood golf tees have a shiny finish and are available in all standard colors. Free artwork design. Top quality, Budget Prices in the USA and Canada for bulk personalized tees. American clients pay no taxes. Production Time: 5-7 days after art approval. Contact us for faster delivery. Canadian Clients: please multiply the above prices by 1.30 to find prices in Canadian $'s. PRODUCT SIZES: 2-1/8" - the professional size; 2 3/4" and 3 1/4"
COLORS: Assorted; Black; Blue; Green; Natural; Orange; Red; White; Yellow, and more. IMPRINT COLORS: Black; Brown; Burgundy; Dark Blue; Dark Green; Green; Orange; Process Blue; Red; Reflex Blue; Teal; Violet. Up to 4 lines of imprint; 22 characters & spaces per line. Logo imprint available at no extra cost. • Imprint Area: 1"w x 1/2" h.
• RUSH SERVICE available: contact us.